Winter has arrived. And with it the snow will fall. Talk to your aging parents about snow shoveling safety BEFORE they head out. 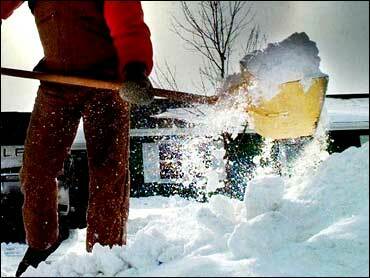 Shoveling snow is a very physical activity and is comparable to lifting weights fast and with many repetitions. In some cases, the arrival of vast amounts of snow quickly, can make shoveling even more dangerous. And late season snows can be more treacherous, because we forget. On average 12000 people a year are injured and 100 die as a result of shoveling snow. Add the back injuries, shoulder dislocation and heart attacks, and snow shoveling is one of the most dangerous activities senior citizens can attempt. Harvard University suggests that people over the age of 50 should take special precautions to avoid snow shoveling hazards. As with any exercise, urge them to should begin with a 5-10 minute warm-up. Have them try walking or marching in place to warm up their body. Dress appropriately. Wearing layers will allow you to adjust to the temperature outside. Be sure to dress warmly enough and cover your head, face and hands when outside for prolonged periods of time. If you become overheated, take a break from shoveling. Pick the right waterproof boots. They will want to protect their feet from the cold as well as keep them dry. They will also want to have non-skid boots to guard against falls on slick snow or hidden ice. Pick a small shovel. Depending on how wet the snow is, a shovel full of snow can weigh up to 15 pounds! Selecting a smaller shovel means lighter loads of snow which can help prevent injury to the body by creating less strain. Stay hydrated. Water plays an important role when people exercise in the summer or winter. Urge them to have a water bottle handy just inside the garage and take a few sips after every 15 minutes of shoveling snow. Shovel frequently. If they are in for a big storm, suggest they go outside and shovel every time the snow fall is about 2 inches. This will help lessen the load and make snow shoveling more manageable. Set a time limit. Shoveling snow is a hard work. With a large driveway or long side walk, they could be shoveling for up to an hour or more. Come inside after 20-30 minutes and start again. This will be the same as a 30 minute vigorous workout. Lift with the legs, not the back. Make sure that their knees are bending and straightening to lift the shovel instead of leaning forward and straightening back up with the back. Our legs have strong muscle groups that can do the work! Push the snow. It's easier to push the shovel full of snow instead of lifting and throwing the snow. Separate the hands on the shovel. Demonstrate that by creating space between your hands, you can increase your leverage on the shovel to make it easier. Avoid caffeine and nicotine before shoveling. Caffeine and nicotine act as stimulants to our bodies by increasing the heart rate and constricting blood vessels which puts more strain on the heart. Never shovel alone. Let a spouse or neighbor know they will be shoveling. That way, if they do get into trouble someone will be looking out and can call for help quickly. Know their limits. Make an agreement with aging parents that any snowfall over 4 inches will be done by someone else. Hire a teen-age neighbor or call a snow-service. Snow blowers can produce many of the same hazards as shoveling. Cutting through large snowfalls is still hard and heavy work. The machines themselves are heavy. Using a motorized machine can create a false sense of safety and many people are seduced into working too hard and too long. Know when to quit. If your parents are getting frail or are unsteady on their feet when they walk, it's time to hang up the shovel. A fall or injury would be very dangerous to their overall health and well-being. Have your aging parents follow these snow shoveling tips and they will surely enjoy the winter more.